Project Lead the Way Instructor Mirannda Figert gives a brief robotics demonstration as the board looks on. Pictured from left are Brett Boggs, Blaine Conley, Jessica McFarland and Figert. MENTONE — Building construction and robotics are hot topics this year at Tippecanoe Valley School Corporation. 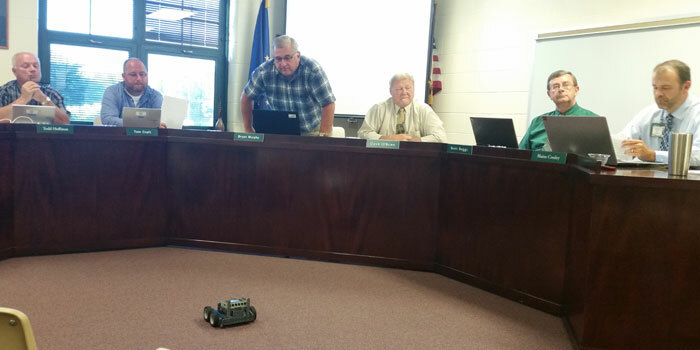 The TVSC Board of Trustees heard updates about the Akron Elementary School and Tippecanoe Valley High School press box construction projects and had a brief robotics demonstration during the board’s regular meeting Monday evening, Aug. 8, at Mentone Elementary School. Akron and Mentone Elementary School Project Lead the Way Instructor Mirannda Figert gave a brief demonstration to show how the schools plan to use Tech Point grant funding. The funds have gone into the purchase of a Vex Robotic Kit, which will allow students to apply both science and imagination as they learn more about engineering, technology and other related topics. The class will be taught in four parts rotating between Akron and Mentone and all grade levels will benefit. Jim Mitterling noted much of the foundation work has been completed already and part of the gym floor has been poured. Work on electrical rough-ins and drains has also continued. Principal Chrissy Mills noted parking is currently difficult, but parents and employees have been understanding. Construction on the TVHS press box, dedicated in memory of Scott Bibler, is nearly complete and the surrounding bleachers are taking shape. The new press box offers an unobstructed view of the football field. A window in the other side of the room also offers a view of the soccer field. Speakers have been attached to the light poles and by the visiting-side bleachers. Superintendent Brett Boggs noted the 2016 Distinguished Alumni and Legacy Award recipients have been chosen. The annual Distinguished Alumni dinner is set for 6:30 p.m. Thursday, Sept. 15, in the Tippecanoe Valley Middle School commons. The event is open to the community. Under new business, the board discussed making health insurance benefits available to all full-time bus drivers. Boggs noted this had been available in the past, but several years ago the board voted to no longer make the benefits available to Class C drivers. Board member Stan Miller was not present Monday evening, so the board voted to table the decision until all members could be there to vote. The board will hold a budget workshop at 6:30 p.m. Thursday, Aug. 18, at the TVSC administration office. The next regular meeting of the Valley school board is at 6:30 p.m. Monday, Sept. 12, at Mentone Elementary School. The board approved revisions to the pest control policy presented at the July meeting. 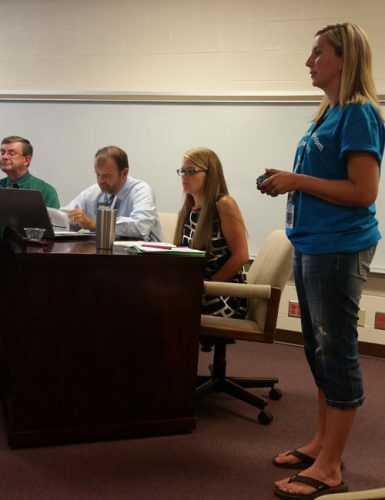 The board approved implementing a second audit of free and reduced lunch applications.